According to the latest US census estimate, Hispanics represent the largest minority, with 17.1 % of the total estimated population for 2013. 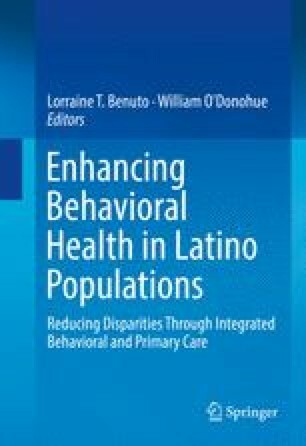 Recognizing the diversity within the Hispanic population of the United States in modern times is an important step when integrated behavioral and primary care services are provided. Thus, one important aspect is the recognition of the within-group differences in the Hispanic population and other minority groups. One example is the Puerto Rican population, which has a very particular sociopolitical and biopsychosocial background that should be taken into consideration when quality health services are provided. It is important to recognize these differences because knowledge of the history and worldview of the Puerto Rican population regarding issues of health, disease, health-seeking behaviors, and interaction with health providers among other topics will make it easier for the teams of health professionals to bring better services to the patients being served. This aspect includes the importance of prevention, assessment, and treatment of disease and the development of a professional relationship between the interprofessional/interdisciplinary teams and this population. Brown, A., & Patten, E. (2013). Hispanics of Puerto Rican origin in the United States, 2011. Pew Research Center Report. Retrieved from http://www.pewhispanic.org/2013/06/19/hispanics-of-puerto-rican-origin-in-the-united-states-2011/. Deegan, P. (2004). Mentalism, micro-aggression and the peer practitioner. Retrieved from https://www.patdeegan.com/blog/posts/mentalism-micro-aggression-and-peer-practitioner. Schenker, Y., Karter, A. J., Schillinger, D., Margaret Warton, E., Adler, N. E., Moffet, H. H., … Fernandez, A. (2010). The impact of limited English proficiency and physician language concordance on reports of clinical interactions among patients with diabetes: the DISTANCE study. Patient Education and Counseling 81(2): 222–228.